King Robert Baratheon is dead. And while his son, King Joffrey is technically a Baratheon, everyone knows that truly it’s the Lannisters that control the Iron Throne in King’s Landing. And with their deep pockets, it’s going to be very hard to unseat them. The Lannisters spare no expense when it comes to war, and their leaders have been conditioned and trained by the very best that money can buy. Even away from the field of battle, their money can make moves that demoralize opponents and rally their own. This month, four new box sets will be released for the Lannister forces in the A Song of Ice and Fire: Tabletop Miniatures Game. Let’s take a look at them in more detail and see what sort of things a huge stack of gold can afford. Strong troops need strong leaders. Some show their strength on the battlefield, like the Hound, Tyrion, or Lord Tywin. For others, like Maester Pycelle and the High Sparrow, their power is felt in the political arena. But make no mistake, they can influence the outcome of a battle all the same. 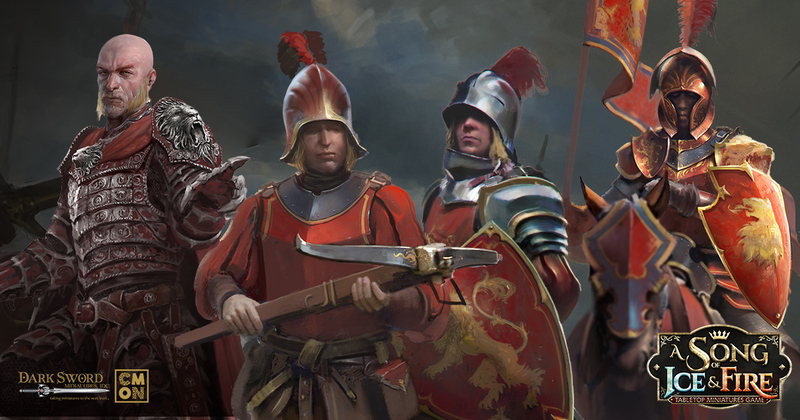 The Lannister Heroes set gives Lannister Commanders a powerful advantage in the war for the fate of Westeros. The Lannisters spare no expense when it comes to outfitting their troops. And when it comes to a unit as special as their mounted knights, cost is never an issue. The Knights of Casterly Rock have literally the best equipment and training that money can buy. And they are worth every penny on the battlefield as they cut their way through enemy ranks. The Lannister Knights of Casterly Rock Unit Box brings a fast, hard-hitting, and durable unit to the battlefield. They are especially deadly on the charge, with their weapons gaining Critical Blow and Sundering. Enemies will also quickly become disheartened fighting them, being forced to make Panic Tests whenever the Knights survive a round of combat. Wars are fought with money, and the ability to arm troops with the finest steel and equip them with armor to keep them alive and hacking at the enemy goes a long way over the course of a battle. The Lannister Guards are not the fastest, or even the strongest in the war. But what they have is an incredible level of defense, giving them the ability to wear their opponents down. Wars are won by those with the will to continue fighting, and someone receiving a huge paycheck to keep fighting is a rather motivated soldier. When it comes to training soldiers, Crossbowmen require a lot less work than average. The real cost comes in the production of the crossbow itself. Technological advances aren’t cheap. Keeping weapons in working order during war is no easy task. Still, a family with resources like the Lannisters can afford to keep this ranged killing machine armed and ready for battle. The Lannister Crossbowmen are deadeye soldiers that take advantage of the technology available to a family of means. At close or long range, their bolts can pierce even the thickest armor. For the Lannisters, the War of the Five Kings is a defensive campaign. They hold the reins of power, and they are going to do everything in their power to keep them. With deep coffers and individuals of extreme skill and cunning, the chances of dethroning them are slim. If they have anything to say about it, their line will be seated on the Iron Throne for the foreseeable future. These new releases will be hitting store shelves on September 28, giving Lannister Commanders all the tools necessary to maintain power. Read more about the Lannister Heroes 1 set here. Read more about the Lannister Crossbowmen set here. Read more about the Lannister Guardsmen set here. Read more about the Knights of Casterly Rock set here.